But no, GTFO isn’t redundant at all, at least not with those addons. Unlike DBM, that has a loud trumpety sound when you are standing in something awful, BigWigs is set up differently and is not as blatant. So while the warnings of things to come are, IMO, better in Bigwigs, the “GET OUT, MORON” warnings are a bit subtle. GTFO is awesome because it has different sounds for “You are in the ick” and “You are standing next to someone with the ick”. It also has an independent volume control AND a test mode so you can fiddle with the volume and get it perfect before you start up your raid. 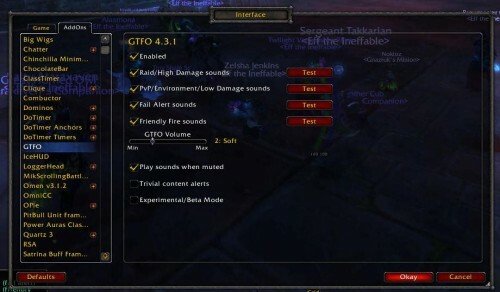 The sounds are pretty distinct and do not blend in with the various pings and blings from other addons. The best “surprising use” I found for this addon is that if you need to take a tick of “ick” for strategic purposes in a raid (we just started the Ascendant Council), you can be sure you actually GOT a tick of ick by the reassuring buzz of sound in your ear. Yes, there is a problem of being in the ick too SHORT a time and not getting a tick (horrors). As someone who often gets healer tunnelvision, I need all the help I can get. 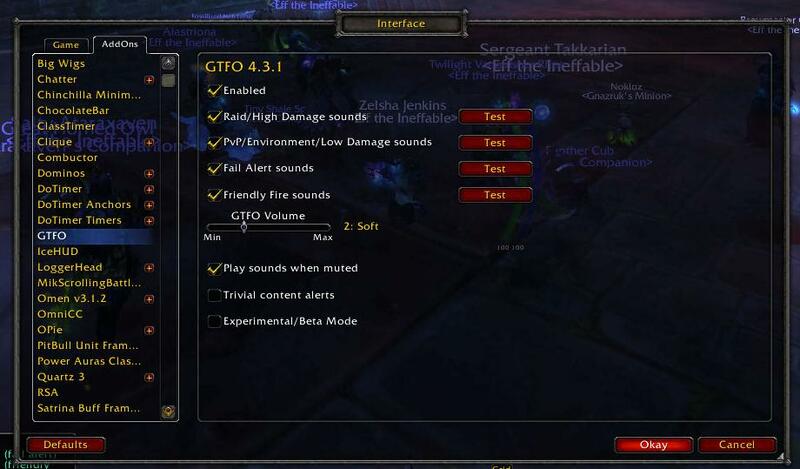 GTFO is an extra nudge toward better raid (and instance) awareness. Definitely recommended. I’ve been using GTFO for about a month now and I estimate that I get out of the bad stuff twice as fast. It’s top-level ‘move, moron’ noise just cuts right through the red haze of DPS-ing. The “ick tick” section freaks me out with its rhyme. I do not like to stand in ick! I do not like it but one tick!